The set of NBC’s hit TV series The Office includes an office suite (where many hijinks ensue) and an attached warehouse. In Season 2, Episode 5, office manager Michael Scott visits the warehouse and causes colossal destruction with a forklift. Then, much to warehouse foreman Darryl Philbin’s chagrin, a warehouse employee erases the “936” on a sign that reads: “THIS DEPARTMENT HAS WORKED 936 DAYS WITHOUT A LOST TIME ACCIDENT” and replaces it with a big fat Zero. This scene raises a nuanced compliance issue. 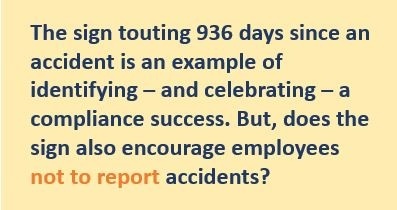 The sign touting 936 days since an accident is an example of identifying – and celebrating – a compliance success. Presumably, accidents were avoided because employees adhered to safety protocols. But, does this sign also encourage employees not to report accidents? Daryl will be pretty unhappy the next time someone has to put a “zero” on the accident sign – and everyone knows it. Nobody wants to be known as the person who broke the winning streak. This is an unintended consequence of the Zero Accidents sign. The same is true for compliance: healthcare organizations that have months with zero compliance reports could have a problem. We of course want to celebrate good metrics and results – but how do we do that while still encouraging people to report problems? A goal of zero hotline calls deters people from finding and reporting problems. The unintended message is: Don’t report. This means that if your compliance dashboard repeatedly shows zero compliance reports – you should raise an eyebrow, not a glass.